Potassium chloride (also known as potassium salt, potassium fertilizer) is an essential raw material for the production of agricultural compound fertilizer, and is also an important chemical raw material. 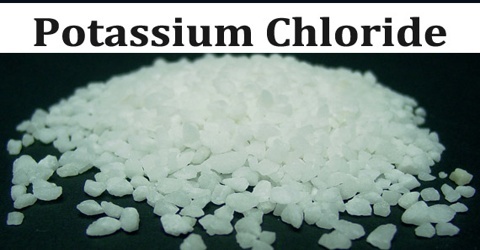 The vast majority of the world's raw materials for the production of potassium chloride are water-soluble potassium salt mines, namely potash salts （KCl + NaCl ) or carnallites （KCl·MgCl 2·6H 2 O). At present, potassium chloride is prepared from potassium-containing brine, and the carnallite is first prepared, and the carnallite is processed to prepare potassium chloride. The main production processes of liquid potassium salt mine include cold decomposition-washing method, cold decomposition-flotation method, reverse flotation-cold crystallization method, sun-bathing method, cold crystallization-positive flotation method, and halogen method. It is a more advanced potassium chloride production process in the world.The biggest advantage of the process is that the product quality is good, the output is high, and the production is continuous. The process is simple, but the utilization of potassium is extremely low. The process has now been eliminated. The production of potassium chloride is more energy efficient, less investment in construction, and easy to master technology. However, the produced product has a fine particle size, poor physical properties, and a low yield of potassium, generally 50% to 60%. This method is being phased out gradually. This process provides significant energy savings compared to cold decomposition-flotation and cold decomposition-hot melt crystallization. The process was developed in 1979 by Israel Dead Sea Engineering. The whole process is carried out at room temperature except for the drying process. It is the best process for preparing potassium chloride by using carnallite as raw material. The processes in Jordan and Israel are mainly for screening after harvesting through the Dead Sea salt field. Coarse grain carnallite is directly subjected to cold crystallization. Fine-grained carnallite is subjected to reverse flotation, concentrated dehydration and then cold crystallization. After cold crystallization, it is sieved, concentrated and dehydrated, washed and dehydrated, and dried. It is then sieved to obtain a coarse and finely divided potassium chloride product. The process is mainly divided into pulping, reverse flotation, dehalogenation, cold decomposition crystallization, and filtration. The pulping process is a process of adding a certain amount of potassium chloride or carnallite saturated brine to a certain solid-liquid mass ratio in the ore brine ore. A certain amount of tailings is usually added to increase the resource recovery rate. The ratio of carnallite ore quality and solid-liquid quality normally is 15~40:100. The reverse flotation process removes some of the sodium chloride impurities in the carnallite and transports them to the tailings pond to obtain the low-sodium carnallite, which is the carnallite concentrate.The sodium chloride collector added in the reverse flotation process is alkyl morpholine and fatty amide.The amount of fatty amide added per ton of carnallite is 100 ~ 400 g, and the alkyl morpholine is 15 ~ 150 g.
In the dehalogenation step, the carnallite concentrate slurry after removing the sodium chloride impurities is subjected to sedimentation concentration, and then dehalogenated by a centrifuge. The cold decomposition crystallization process is a process of decomposing and crystallizing the dehydrated carnallite concentrate by adding water or magnesium chloride unsaturated solution. The water added per ton of carnallite concentrate is 800~1 000 kg, or the unsaturated solution of magnesium chloride added is 2 100~4 500 kg. It is also possible to mix water or a magnesium chloride unsaturated solution, and to decompose and crystallize the carnallite to obtain potassium chloride crystals. In the slurry consisting of carnallite ore and saturated brine, sodium chloride flotation agent (alkylmorpholine and fatty amide) is added. Increase the hydrophobicity of the surface of the sodium chloride crystals, stir and blow into the air, the water layer on the surface of the sodium chloride is rapidly broken, and is tightly combined with the bubbles to form a foam which rises to the surface of the slurry. The carnallite remains in the slurry due to its hydrophilicity. The foam layer containing sodium chloride crystals is separated by a squeegee of a flotation machine to achieve the purpose of removing sodium chloride. The theoretical basis of carnallite cold crystallization is controlled rate decomposition and controlled rate crystallization theory. 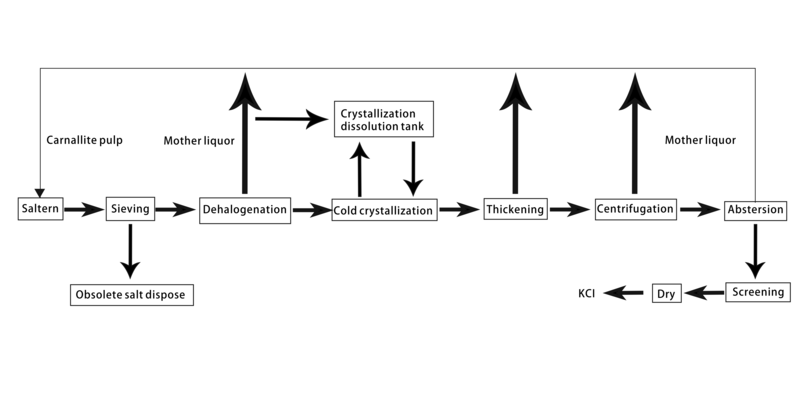 Cold crystallization is mainly to control the decomposition condition of low sodium carnallite, control the supersaturation of potassium chloride in solution, reduce the crystal number of potassium chloride, and achieve the purpose of growing potassium chloride crystal particles at normal temperature.However, sodium chloride cannot be precipitated when the liquid phase is unsaturated, thereby ensuring the quality and particle size of potassium chloride. The quality of potassium chloride produced by reverse flotation-cold crystallization process is high, up to 95%, and the product has coarse grain size and good appearance effect. However, the process is complicated and the operation is not easy, especially the crystallization system. And the process has high requirements for raw ore thus strongly dependent on the raw ore. In the production process of potassium chloride, because the pulp, carnallite contains a large amount of magnesium chloride, potassium chloride, sodium chloride, the chloride ion concentration is large.The recommended material for the plate is titanium. The choice of gasket can be selected according to specific temperature and medium. Among them, the halogen evaporation system, the hot side water vapor is 156-70 ° C, the cold side liquid is 65-110 ° C, and the rubber gasket can be selected as Viton.